Once periodontal diseases develop, more intensive treatments like root canal treatment have to be performed; so don’t live in pain, prevent periodontal diseases by using the best periodontal disease toothbrushes by NeoB Co. Ltd. These toothbrushes allow you to clean below the gum-line, where the bacteria that cause gum disease are found and where other brushes, interdentals and floss can’t reach. Keeping these awkward areas free from bacteria will get rid of all your symptoms such as inflammation, soreness and bleeding gums. 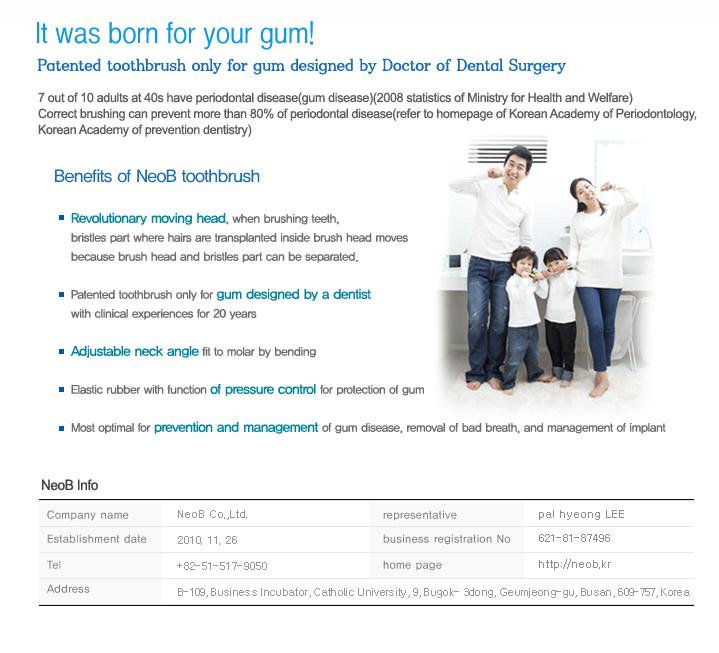 As a leading patent holding manufacturer of periodontal toothbrush in Korea, we strive to offer products that will help our customers maintain healthy dental care. We always recommend our customers to not just use our high quality toothbrushes but to visit dentists regularly for the best oral care at home. NeoB Co. Ltd’s specially designed toothbrushes not just help in curing periodontal diseases but also help in preventing them. Contact Us for more details about our patented products.